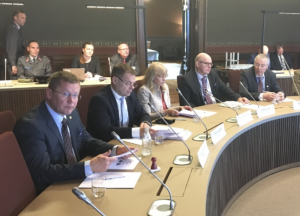 Hybrid CoE organised a Counter Hybrid Threat (CHT) seminar in Helsinki on 11–15 September, co-hosted with the Finnish Defence Forces. The seminar was supported by lectures from European and North American partners as well as from NATO. The seminar gathered some 50 participants of mid-level policy staff and leaders responsible for prevention, crisis management, analysis, planning, information, and communications, representing key organisations. Conclusions by the group were introduced to governmental leaders like the Permanent Secretaries Mr Peter Stenlund (Ministry for Foreign Affairs), Mr Jukka Juusti (Ministry of Defence) and Ms Päivi Sillanaukee (Ministry of Social Affairs and Health) as well as military representatives like Brigadier General Vesa Virtanen (Finnish Defence Forces) and Capt(Navy) Jukka Savolainen (Hybrid CoE). Similar national events have been organised also in other countries in the Baltic Sea region. These CHT seminars use an academic approach to bring together nations’ comprehensive approach practitioners (military and non-military) in a guided educational setting to address topics related to their perspective on preventing or countering hybrid threats. The end product of each seminar is a holistic and multi-organisational presentation to appropriate officials on the problem, potential tasks, recommendations and conclusions developed by the group. Hybrid CoE is planning to organise, in cooperation with its participating countries and NATO, a high north area Counter Hybrid Threats (CHT) regional seminar in the beginning of next year. This would bring together comprehensive approach practitioners from the Nordic countries. It is recognised that each nation in the high north region faces relatively similar hybrid threat challenges. Therefore, much can be gained from coming together to discuss these issues and exploring where multinational regional solutions may be appropriate. Such a regional seminar has already taken place for the Baltic countries.